As we went to broadcast, the ousted Libyan leader Col. Muammar Gaddafi was reported dead outside his hometown of Sirte, eight months after the first protests erupted against his longtime rule. Gaddadi was reportedly shot dead after his convoy was bombed in a NATO air stike. The news came as the interim Libyan government said it had captured Sirte, Gaddafi’s hometown, and the last major pocket of resistance held by fighters loyal to his rule. Democracy Now! correspondent Anjali Kamat reports the latest news out of Libya. Amateur video purportedly shows former Libyan leader Muammar Gaddafi captured by revolutionary forces, wounded but alive.. So far it’s unclear if he was killed or died of wounds sustained during the capture by NTC forces. Early in the Libyan morning the 42-year rule of Muammar Gaddafi came to an end as National Transitional Council fighters overran forces loyal to the Libyan ruler. With questions still looming around the exact circumstances of Gaddafi’s demise, Abdel Hafiz Ghoga, NTC Vice Chairman in Bengahzi made an official announcement to the world about Gaddafi’s death. 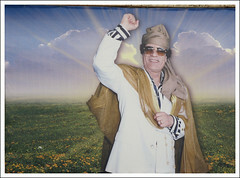 Gaddafi at one point was a hero to the Western world, but for the last year Gaddafi was looked at as a villain. There are many reports explaining the reasons why the change of heart from the Western powers. Pepe Escobar, correspondent for the Asia Times, helps us understand what happened and what lies ahead for Libya. This entry was posted in All Posts News Politics and-or Videos, Dandelion Salad Videos, Death-destruction, NATO, Oil and/or Fossil Fuels, Politics, Propaganda, War, War Crimes and tagged Barack Obama on Dandelion Salad, Civil War, Escobar-Pepe, Firoze Manji, Gaddafi-Muammar, Libya, Libya on Dandelion Salad, Meet the new boss the same as the old boss, Muammar Gaddafi, Pepe Escobar, The Real News Network. Bookmark the permalink. protect this planet. By the way, Libya was a well run country and without any debt. Perhaps many of us would have done the same as Gaddafi given the situation he faced he did more good than bad. Shame on the human species who denies food, clothe shelter, medical care, free education, meaningful work, and spiritual liberation to beings due to insaturable greed. Gaddafi gave a lot of these things to his people. He gave more than Capitalism and corporate influences and banks greed ever give. They will destroy all life on this planet earth if we let them. I am ashamed to be part of this human species. Be ashamed oh leaders of the world to make Gaddafi’s death a necro-spectacle to be witnessed on this earth. Perhaps it also males you think. You are not love and honored yourslelf and this may all happened to you cruel leaders too and you know this and are deeply afraid to loose power. Rest assured you loose it anyway. You too will die and you know what: be ashamed you in your way of wanting power did not stand up for the poor and forgotten and the climate and you too are responsible for the human species perishing on th is planet earth due to your greed. Be ashamed oh leaders of the World- be ashamed. Nature will get you if people can’t, remember that. Our intention will get you. We do not need weapons. Our curse is enough as you have done bad not thinking about the people, the animals and plants of the world the climate and the environment. Leaders of the world – be ashamed. You will suffer the consequences due to karmic reactions and I am sorry for your way of hurting others instead it is your duty to protect. You all failed us human beings. Be ashamed! Advice: Never enjoy other peoples’s suffering ist is so wrong. You failed humanity. what if barack obama’s dad was Libyan and not Nigerian, and that he had aunts, uncles and cousins in Libya? what if his family supported their leader and would not leave libya? would he still sign off on the NATO bombing campaign to possibly murder his own family, who he loves, through ‘ collateral damage ‘ ? our leaders and their supporters have lost their MORAL COMPASS and our empire continues to bankrupt and destroy itself. keep speaking out fellow americans, and never allow the propaganda machine to reach you! let us pretend for a moment that barack obama’s dad was not nigerian, rather libyan. he has aunts and uncles and cousins in libya, who he loves, and who refused to stop supporting their leader or to leave the country. do you think he would sign onto the bombing campaigns of libya, where many many civilians have been murdered… knowing that his own family could be innocently part of ‘ collateral damage ‘ ? this empire has no conscience, thus no MORAL COMPASS!